Yikes… the carpenter ants are going crazy, seems like. Got home from work today to answering machine full of messages and missed calls. The messages are great – I really appreciate it when people leave them. The missed calls, not so much! Wish I could be here to take your call right away all the time… but on the other hand, I love teaching too, so…. An article on the CBC site today talks about increasing numbers of carpenter ant infestations in Windsor, ON and Halifax, NS … no mention of here in cottage country Ontario but could have told them that we are definitely seeing a lot more calls for them here as well. Used to be mostly Balm Beach that had them, with a few up Honey Harbour way as well… then last year, started to see them all over Tiny Township; here in Victoria Harbour and Port McNicoll; up in the Parry Sound and Huntsville area…. and this year they seem to be everywhere we cover. Not that we’re complaining, of course. Ross is happy to go to wherever the ants are and evict them for you. 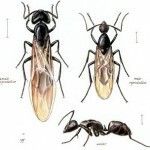 You might be interested to know that there can be major differences in how pest control companies treat carpenter ants. Spraying kills only visible ants (generally about 10% of the population) and while it will provide some temporary relief from the aggravation of seeing ants wandering around, it allows the queen(s) to continue churning out new ants, and the ants that you are not seeing to continue to damage the structure of your home or cottage. You should be looking for a pest control company that is actually going to solve the problem, not just mask it – and that typically involves bait. Do be sure that when you are comparing quotes on carpenter ant treatment, you are actually comparing the cost of fixing the problem, not signing on for years of masking it. If you think you might have carpenter ants (big ants, sometimes with wings; piles of sawdust-like material, which can be coloured if they’re tunneling through insulation; and or noises in your walls or ceilings) give us a call at 705-534-7863, or email ccpestcontrol@gmail.com and we will fit you in.